'Game of Thrones' Season 8 will consist of 6 episodes. Read here to know the official run time of 'GoT' S8, episode wise. 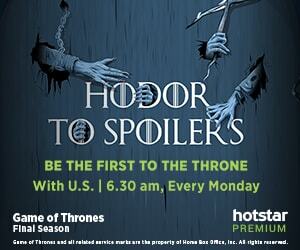 Happy Game of Thrones Day to people in India. The show has finally aired on Hotstar Premium and die hard fans of the fantasy drama series can't wait to get their eyes on the season premiere. The 54-minute long episode was marked by some long pending reunions and one major revelation in store for the King in the North, Jon Snow. The show's premiere set the tone for what the viewers can expect from the remaining five episodes. All the major characters are preparing for the big battle against the White Walkers, while holding up in the North. And as they prepare for the enemy and its ice-zombie dragon, we have collated for you the run time of the entire GoT season 8, episode wise. The longest duration is held by the last two episodes, which are directed by series producers and creators DB Weiss and David Benioff. The longest episode of GoT so far stands at 81 minutes– season seven finale, titled The Dragon and the Wolf. Commenting earlier on how GoT would end and what pressure it takes on the makers to devise an appropriate ending, Benioff had said, "From the beginning, we’ve talked about how the show would end. A good story isn’t a good story if you have a bad ending. Of course, we worry. It’s also part of the fun of any show that people love arguing about it." The anticipation of the fans is at an all time high. The finale season, which will consist of six episodes in total, will pit the white walkers, lead by the Night King, against all the living souls. It remains to be seen how the much talked about ending shapes up. Meanwhile, read Game of Thrones Season 8 Episode 1 review here.